On the occasion of a Nintendo Direct, Nintendo has announced a new version of the handheld consoles 3DS and 3DS XL. Nintendo has shown quiet since the launch of the consoles last generation of Sony and Microsoft. The manufacturer seems struggling to defend the assets of its Wii U. This Aug. 29, Satoru Iwata held another Nintendo Direct. Announced just yesterday, this video was exclusively devoted to the 3DS. Some games were presented as "Bravely Second". Nintendo especially surprised by announcing a new version of the console 3DS and 3DS XL. Rather than improved version. In terms of screens, the 3D mode is improved. 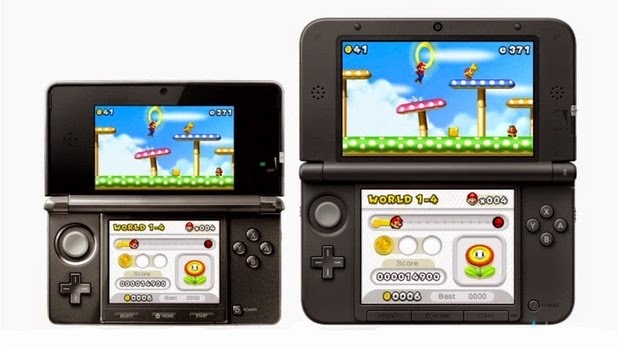 There is no change to the 3DS XL, but on the 3DS, the new version features larger screens. The lower screen is 3.53 inches, against 3.02 previously, and the top 3.33 inches (against 3.88 inches). The new 3DS and New 3DS XL equipped with new battery. The large-format portable console has a range up to 7 hours and up to 6 hours for the New 3DS. Moreover, these versions are equipped with NFC technology for contactless communication with Amiibo including figures and a microSD card reader. 3DS and 3DS XL will be available in Japan from 11 October. They will be marketed with the equivalent prices respectively about 120 and 140 dollars.